Summer is just around the corner and you have a plan in mind for you and your family? A fire pit offers you warmth in a cool evening, and you can also cook marshmallows in your backyard! Fire pits are made to contain and prevent the spreading of fire, and it is so common that they are now selling ready made ones in stores. Conventional fire pits are made by stainless or pressed steel but traditionally, it is made by stones, bricks or clay. Traditional fire pits are very easy to make and inexpensive. If you have the extra materials to spare and the perfect spot for a fire pit, read on as it tells you exactly how to build a fire pit. Carefully sketch and draw out the blue print of your fire pit design with the measurements of the space that you have. Beware not to build your fire pit too near to any buildings or trees. 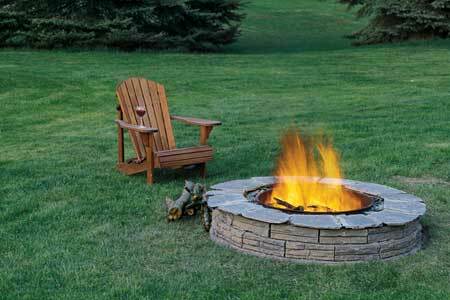 Settle down with the size of fire pit that fits into your backyard. Roughly estimate and place order on the amount of materials that you might need. Most of the materials like gravel, landscaping blocks, barbecue table tops and shovels can be purchased off-the-rack at local marts. Make sure that the landscaping blocks is at least 6” in height. Then, hammer a stake into the edges or perimeter and loop string over the stakes to mark the outline of the fire pit. Dig out at least 2 feet of soil and place in a piece of black plastic followed by 4 inches of gravel and sand each. Level the area and make sure that it is flat before you lay on the base blocks. After laying out the first layer of blocks, cover the outside of the blocks with gravel to make the fire pit strong. Continue to lay out the other layers of blocks but you will want to check the diameter of the fire pit after laying every layer to ensure that the diameter is correct. You may also purchase a steel ring from local garden supply stores. The steel ring is used to hold the fire pit in place and to make sure that it is round. Clean the blocks with a brush and leave a few gaps between the blocks of every layer so that the fire can draw air into itself. Set the steel ring in place before you put in the steel ring. Soak the fire pit with water before starting up a fire. Have at least 5 gallons of water and a shovel with you to put out stray fires. That is all you need to know about how to build a fire pit.